Now the weather is warming up and spring is finally here, you might consider stopping using your fire and put it to rest for the summer. 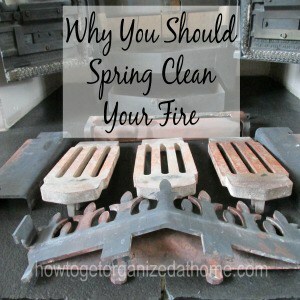 If you rely on the fire for hot water, then you will just need to ensure that you tackle the spring-cleaning and get it ready for the summer work too. Whatever you choose, it is important to do a spring check on your fire and to perform a deep clean; it allows you to check to see if you need to purchase any replacement parts. Knowing the dangers of having an open fire is important, you must be aware of the cleaning instructions for your open fire and you must follow these carefully. We use duel fuel and means we have to do a basic clean after every use. However, this doesn’t really clean the fire, or check to see if there is any damage that needs replacing before the winter. If an open fire maintenance is poor, then there’s a possibility you could get carbon monoxide poisoning and this can be fatal. Always have a working carbon monoxide detector in the room where you have an open fire, it could save your life. Chimney fires are another potential source of danger, it is important that you have your chimney swept regularly, I do mine once a year just before the weather turns and I need to think about lighting the fire. I like the idea of a clean fire, to get all the ash out and check the various parts for damage. I know that there’s a couple of spare parts that I must order this year and this spring clean gives me time to check out the various parts and puts the process of ordering spares a chance to arrive before the fire’s needed again. It also gives me time to book the chimney sweep to come at a convenient time for both parties. I like to book this late August time, it then gives me a few clear months either side of the use of this, to ensure that it is ready before I need to use it again. I like being prepared, I hate a last-minute rush to get a job completed. I need to plan things in order for things to work satisfactorily, reducing my anxiety levels. Our fire recommends that we do a chimney sweep once per year; make sure you are aware as to the amount of times per year you need to have yours swept. The amount of times between sweeping can vary depending on what you are burning, the area you live and what your fire manufacturer recommends; it is important to follow these guidelines to ensure you don’t experience a chimney fire. Having the fire nice and clean makes it easier to keep on top of the cleaning, in the winter when I use the fire, when it’s cleaned a thin layer of dust always appears, so a nice clean dust free fire reduces the amount of dust that appears in my home, saving me even more time. This is something we have wanted for a long time, we had one when we lived in rented accommodation and loved it. You have to make sure that you are able to have a fire in the area you live, in some places there are restrictions so before spending any money check these details first with your local council or government office. Another reason was the rising cost of heating, it has become so expensive to heat our home with the usual central heating that having a fire we could use was a better option, it is amazing how much heat a fire can produce warming up the home. Therefore, if you do have an open fire ensure that you are maintaining it properly, regular maintenance is a lot cheaper than having a house fire because you forgot to get the chimney swept, don’t forget that carbon monoxide detector too, it can save lives. Great reminder to for everyone to maintain their fireplace. I know it’s easy to overlook and sometimes can get neglected.